Back in April, after a visit to the Edinburgh Botanic Gardens, I decided I wanted to get myself an Amelanchier tree. 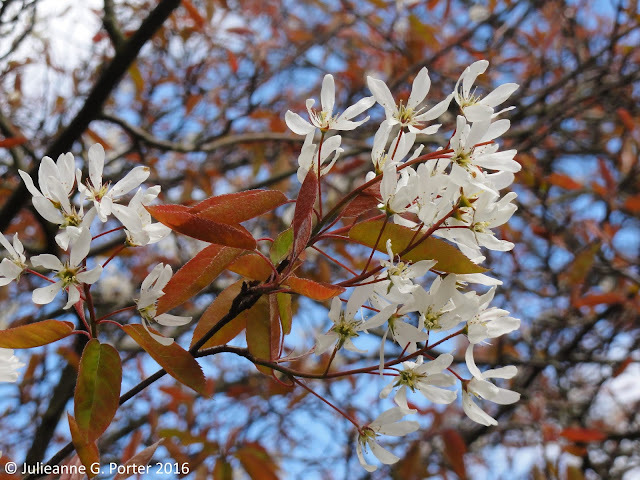 One common name for Amelanchier is Juneberry, another being Service Tree. Here's a reminder of what they look like in Spring. I have a section of my Long Shady Border that is crying out for some editing (begging for it...!) and have just the place for the tree. I did a lot of research and decided that the particular Amelanchier that would most suit this site would be Amelanchier laevis 'R.J. Hilton'. It's a smaller variety, liking moist acid soil - perfect for the damper end of this border. It took quite a lot of research and many phone calls to finally find a nursery that sold this tree, one over in Retford, 34 miles away. The nursery owner had an 8ft tree. Excellent. The thing is, we only have a small 3-door car, and they didn't do delivery to Sheffield. I wasn't to be deterred. I thought about it and came up with an idea of how I might safely transport an 8ft tree home. 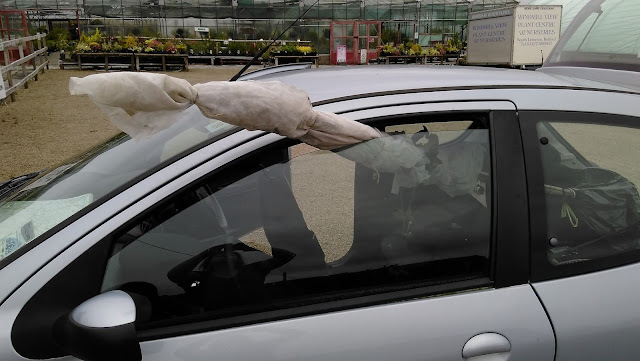 Carefully wrap it up in fleece, tie the fleece, the carefully position it in the car, with me stuck in one corner of the back seat looking after it whilst Kevin drove. 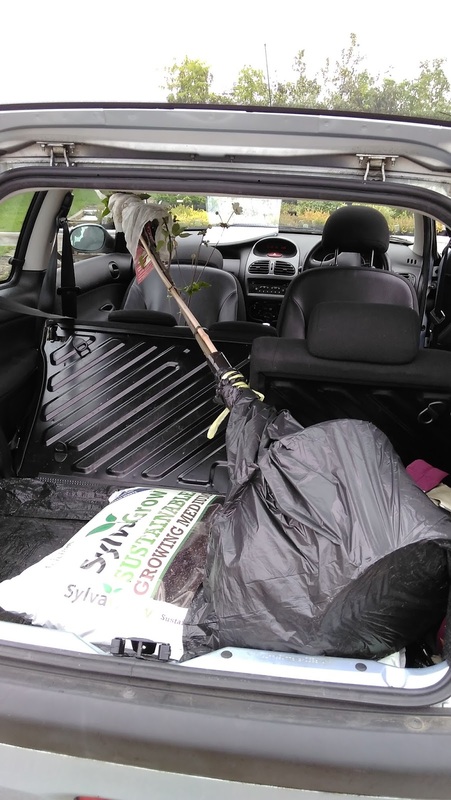 We then artfully put it in the car. You can see from the front end why i was so concerned about wrapping up the tree. 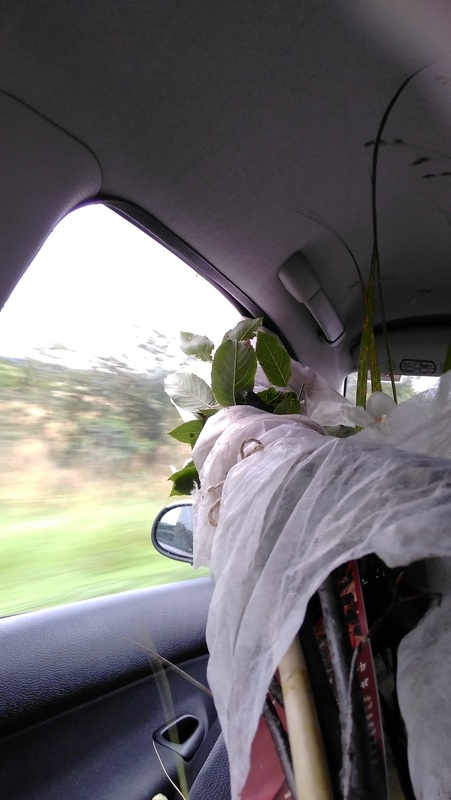 I knew we would have to hang part of the tree out the window and by doing so, the high winds whilst driving up to 50 mph could risk damaging the tree. 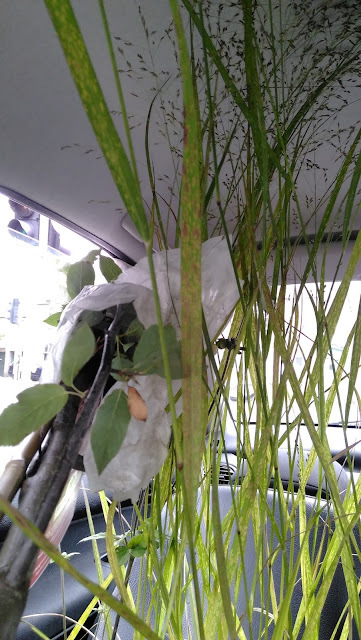 And that's how you transport an 8ft tree in a small 3-door car. So what does the tree look like now at home? Well, you have to wait for that. I've finally found a gardener to help me out but he cannot be here until end September/early October, so it won't be planted in the border until then. So you'll have to stayed tuned for the next episode. *Full credit to J-P over at Next Square Metre for coming up with this in a tweet. It was too good not to nick. Yeh, Amelanchier seemed like a good all round choice. Mine won't get as big as your Swedish birch, but I hope it is happy and lasts for as long. Brilliant! My friend has just moved into a house with a long shade border of her own (quite damp all along it, I think) and I'm adding this to her planting possibilities list! Not all trees like the damp, so this should be a good one for us both then. Amelanchier is my favourite tree, I'm sure yours will be very happy with you. Mine has grown rather larger and wider than expected so I'm glad you have a smaller variety.